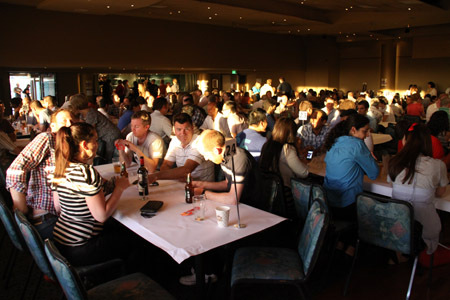 Last night over 200 people packed the big function room of the Randwick Labour Club and enjoyed a great trivia night organised by Team Run 4 Vision. After a short presentation by myself about the event Sydney Coastrek and the reason of running 100 km next Friday, Colin, our trivia master, opened the ‘show’ and started testing those brains. We had some heavy competition going on and the 50-odd prizes donated generously by our sponsors all found a deserving winner at the end. My blind friend Ben attended with friends from his team. Team Achilles will be participating in the 50-km day trek from Palm Beach to Balmoral Beach. An all visually impaired team together with four designated guides on a world-first attempt to finish a 50km team event! 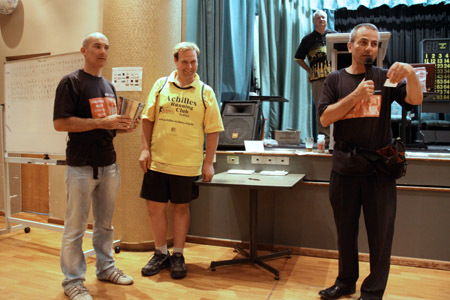 Ben kindly helped us to draw the winners of the raffle competition. 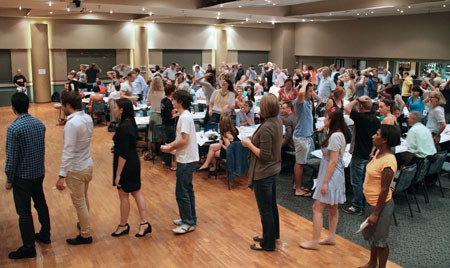 Thanks to a great effort of all participants we raised almost $7500 on the night, an incredible amount that will allow The Fred Hollows Foundation to restore sight for another 296 needlessly blind people in the developing world. Thank you to everyone! There are five days to go before our team will be at the start to the 100-km Sydney Coastrek. It is still time to support our team to reach our goal of raising $10,000 and save 400 needlessly blind people’s sight.